18/20 Cellar Bar, Dining & Rooms Restaurant with RoomsCentrally located in the heart of the popular market town of Keswick, 18/20 Cellar Bar, Dining & Rooms offers an ideal base from which to explore the spectacular Northern Lakes. Situated on a quiet street around the corner from the main market square, we present a bar lounge and restaurant decorated in a contemporary style whilst retaining traditional Lakeland character. 18/20 Cellar Bar, Dining & Rooms offers 4 bedrooms comprising 2 double and 2 twin/family rooms, sleeping up to 4 people. We can also provide cots if requested. All bedrooms are comfortably furnished in a modern style and offer en suite bathroom, TV and tea & coffee making facilities. 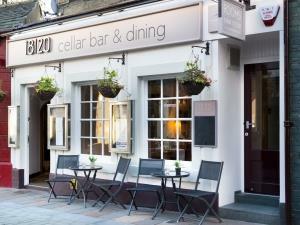 18/20 Cellar Bar, Dining & Rooms sometimes limits bookings to 2 or more days. accommodate your booking for a double, twin or family room for two adults and up to 2 children and a baby. Childrens rates on request. Flexible sometimes limits bookings to 2 or more days. Leave the M6 at jct 40 and take the A66 to Keswick. From here follow the main road through the town, turn left at the mini roundabout and continue until Central car park. The rear entrance of Sweeney's is to the far right hand side of this pay and display car park. The front entrance is located on Lake Road. Very good pet friendly accommodation in the centre of Keswick. Great breakfast and clean, spacious room. Will definitely visit again.